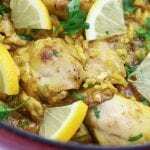 Fresh and aromatic, this One Pot Lemon Chicken and Rice is bound to become your new favorite comfort dinner. Buttery chicken, brown rice and savory spices. So delicious and easy! Preheat a large dutch oven over medium/high heat. Add butter and coat bottom of pan with melted butter. Sear half of the chicken in butter, skin side down first, for 7-8 mins per side or until lightly golden brown. Remove seared chicken to a plate and repeat with rest of chicken. Over the same heat add onions to the butter and sauté until translucent, making sure to stir often removing brown bits. Add garlic, spices and pepper and sauté for another 2 minutes. Stir in brown rice and sauté for another 1-2 minutes. Pour in lemon juice, chicken broth and stir. Place seared chicken pieces evenly through out dutch oven. Bring to a boil. Once boiling cover and lower heat down to medium/low. Cook until liquid is absorbed and rice is tender, about 50-60 minutes. Garish with fresh chopped parsley.